Use this cover letter example to apply for the latest civil engineer jobs. You should amend this example before using it for your applications. 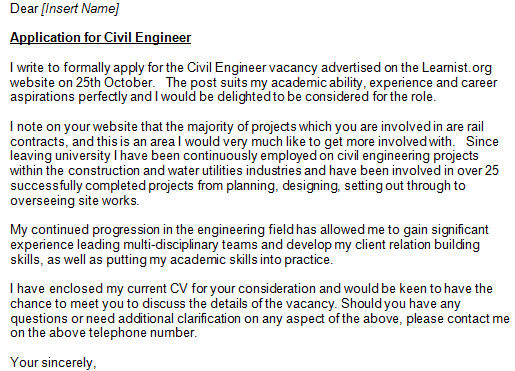 I write to formally apply for the Civil Engineer vacancy advertised on the Learnist.org website on 25th October. The post suits my academic ability, experience and career aspirations perfectly and I would be delighted to be considered for the role. I note on your website that the majority of projects which you are involved in are rail contracts, and this is an area I would very much like to get more involved with. Since leaving university I have been continuously employed on civil engineering projects within the construction and water utilities industries and have been involved in over 25 successfully completed projects from planning, designing, setting out through to overseeing site works. My continued progression in the engineering field has allowed me to gain significant experience leading multi-disciplinary teams and develop my client relation building skills, as well as putting my academic skills into practice. I have enclosed my current CV for your consideration and would be keen to have the chance to meet you to discuss the details of the vacancy. Should you have any questions or need additional clarification on any aspect of the above, please contact me on the above telephone number. – Civil Engineer cover letter example. – Civil Engineer salary and average pay rates.